Jointly presented by the Asian Canadian Writers’ Workshop, Gung Haggis Fat Choy, Historic Joy Kogawa House Society and Vancouver Asian Heritage Month Society welcomes an evening with Wayson Choy. 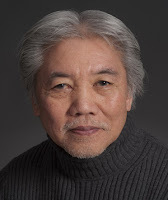 On October 15, 2012 at 11 am on the Southeast corner of the intersection of Pender and Gore, Project Bookmark Canada and Wayson Choy will unveil two plaques to highlight and commemorate the physical landscape so vividly rendered in Choy’s iconic novel, The Jade Peony. Members of the public are invited to attend the plaques' unveiling and to hear the author read from his novel. A Wayson Choy Special Tribute Evening will take place prior to the unveiling on Sunday, October 14, starting at 6pm at the Floata Chinese Restaurant, 180 Keefer Street. This unique event will take the audience on a 73 year journey back in time to witness the remarkable life of this literary iconic born in Vancouver’s Chinatown in 1939. During the evening, you will hear for the first time, stories told by relatives, close friends and colleagues from Choy’s past to illuminate Choy’s remarkable journey beginning with his early care-free childhood days at home and school and taste what it was like to grow up in pre-war Chinatown. There will be stories re-accounted by his childhood neighbour and best friend, Garson Lee and his older tap-dancing sister, Shirley Wong who babysat a young Sonny Choy. Listen in on intimate anecdotes told to you by his university schoolmates and instructors and how he became the precedent-setting first Asian-Canadian to enrol in UBC's creative writing program. The evening’s program will include a rare interview footage of Carol Shields who, during the summer of 1977, taught as a guest instructor for a creative writing class . Hear her impression of Wayson and the exercise she used to inspired Choy to create his famous short story, The Jade Peony. The story was first published in the UBC Alumni Chronicle in 1979. Wayson’s journey as a writer continues when his publisher, Douglas & McIntyre recounts that faithful decision to publish a ground-breaking collection of linked stories titled The Jade Peony. Many successes followed and after the many literary prizes and acknowledgements, in 2002, the book was chosen as Vancouver Public Library’s inaugural ’s One book, One Vancouver. The evening will also include appearances by media personalities who have shared intimate moments with Choy and a new generation of writers and readers inspired by this remarkable man’s writing.